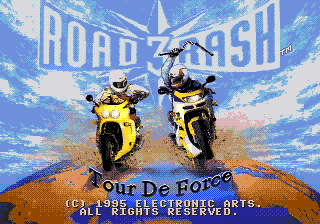 Road Rash 3: Tour De Force is the sequel to Road Rash II, and was released exclusively for the Sega Mega Drive in 1995. Road Rash 3 makes several changes over its predecessor - instead of being set across California (Road Rash) or the United States (Road Rash II), Road Rash 3 takes place across the world. It also makes use of digitized graphics similar to Mortal Kombat. Main article: Road Rash 3: Tour De Force/Magazine articles.